Cute little film I caught at a matinee today (which was absolutely packed with very young kids talking, choking, yelling, and running in the aisles). It was good, lots of little jokes for adults as well as kids, a nice little story and better than most kids fare. I was really surprised that the CG bear never had uncanny valley problems for me. The eyes looked real and the whole thing looked real enough that I forgot about the computer graphics after ten seconds into the movie. I'm surprised it's currently running a 98% at Rotten Tomatoes. I've only seen the best of the best Pixar films do numbers like that and while this had a very good story and good acting, it didn't seem like the absolute best kids film ever, but then again, I was watching it with a really disruptive audience that took me out of scenes often so I might have missed some of the heart of the film. I'll watch it again when it goes to VOD later this year and hope it improves for me. I really enjoyed the Gruaniad Film Show on this - they're just a normal, everyday London family living in a multi-million pound Notting Hill mansion! After the troublesome production (Colin Firth dropped out, then then there was some tussle over the film rating) I get the impression everyone was surprised it was as good as it was. After working at a London tourist trap for years, I have had plenty Paddington, and I can testify he definitely has a strong fan base. It' s a good movie for kids, but what surprised me was how bluntly it's targetting anti-immigration policies and political platforms popular in Europe right now (see for instance the Jim Broadbent character, a Holocaust survivor who came to the UK as a kid on the Kindertransport) . There's also a bit at the end that's pretty accurate (and again surprising in a kid movie): European geographical societies were indeed a support network for colonial policies in the late 19th-mid 20th centuries, not just a bunch of ballsy dudes. Someone did his/her homework here. After all the negativity from the trailer, this was a pleasant surprise. Loved the little asides for the adults in the audience, plus the frequent nods towards Wes Anderson. Based on the trailer I was ready for it to be terrible--I'm not sure I've seen a worse trailer ever. I'm now reconsidering based on these reviews and what I'm hearing. I enjoyed it. It's target audience is maybe a couple years younger than the typical Pixar outing, or maybe it's just not as smart. But it's fun. Definitely agreed that they did a very good job with the CGI for the bear. I feel naive for always thinking adventure societies were just ballsy dudes. And kinda bad that I learned here that it really wasn't that simple. I do want the Geographers Guild's Gilliam-esque pneumatic tube system for my home though. I went to see it the other day. It's at the end of its run in London - just me and a small child and their mother in the cinema (I hope they enjoyed it as much as I did - they seemed a little subdued by the experience). I must confess, I was running an ongoing comparison with the book at the back of my mind (which is unfair and wrong, but I couldn't stop it). Enough details pleasingly taken from the book (the cream cake on the railway buffet dining table was straight out of chapter one of A Bear Called Paddington; the bathroom scene and the pickpocket did come from a book, I think but not quite as spectacular as that; Paddington did, indeed, borrow a small dog to carry on the escalator) and the things that did not - the whole explorer/Millicent plot, the Brown family actually having personalities - did actually enhance the film, I thought. In a way, having a scene with Mr Gruber (who in the book is specifically Paddington's friend rather than the Browns'), an explanation of the Hard Stare, the appearance of the famous blue duffel-coat - these things are a sort of fan-service. But, speaking as a fan, or at least someone who was a dyed-in-the-wool fan forty-five years ago, I do feel served. I thought they caught Paddington - the well-meaning nexus of chaos - wonderfully, both in the CGI and the inspired casting of Ben Whishaw (it's incomprehensible that they didn't think of him first). Of course, in the current climate, such a film is quietly political - not just Mr Gruber, but the calypso band who appear to be everywhere, singing London is the Place to Be by Lord Kitchener (who performed it on arriving on the Empire Windrush). But quite right. It was only afterwards that I realised it was made by Paul King, who directed The Mighty Boosh, and it's the Booshian touches I like most of all (the obliging guardsman, perhaps recognising a fellow wearer of the bearskin; the doll's house representing the real house; the mural that withers and blooms to show the changing emotional state of the household; the security guards quizzing each other on ingredients; "I named the bears after my own dear mother and a bare-knuckle fighter I met in a bar once" - the whole introduction is a lovely bit of retconning Paddington's origin, which never really made very much sense until now). I thought that the high Rotten Tomatoes rating might have been because of the preponderance of commentary from the UK (for whom Paddington is a minor saint), but it appears, gratifyingly, that the US critics enjoy it as much. I suspect that, despite its faults (which IMO are mostly bundled together at the tail end of the film), it's so good-natured that it would seem mean-spirited to mark it down. I'm really looking forward to seeing it again on blu ray. Finally saw this on DVD. Really enjoyed it. There were visual surprises like the Doll House and the mural, but I'd add the scene when they are watching the explorer's film and Paddington walks into the screen was quite touching too. Lots in it for adults to enjoy. It did feel very rushed in parts, and maybe that's the fanservice thing. Got to fit in THIS and THIS and THIS beloved thing while still doing the A ("Paddington in peril") and B ("Paddington's mysterious origin") plots and at times it felt like TOO MUCH STUFF. 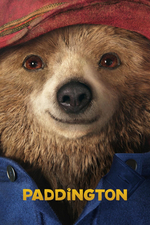 I would happily have dropped the entire backstory plot in favor of more time with Paddington and Mr. Gruber: he's Paddingon's best friend, and he gets one scene in the movie? We spend a lot more time on Mr. Curry, and while I liked Peter Capaldi's performance I don't think the character's actually that interesting. In a way too I feel the book is more charming because it doesn't really tell us much about Paddington's origins: pretty much all we learn in the book is what Paddington himself says, and the book simply assumes that because Paddington is so simply sincere that of course the Browns, and by extension us as readers, completely believe him. I didn't much like the film's incredibly-skeptical version of Mr. Brown; although it does set up a nice Mary Poppins transformation for him to become the hero figure. And how joyfully it celebrates immigration and multiculturalism.